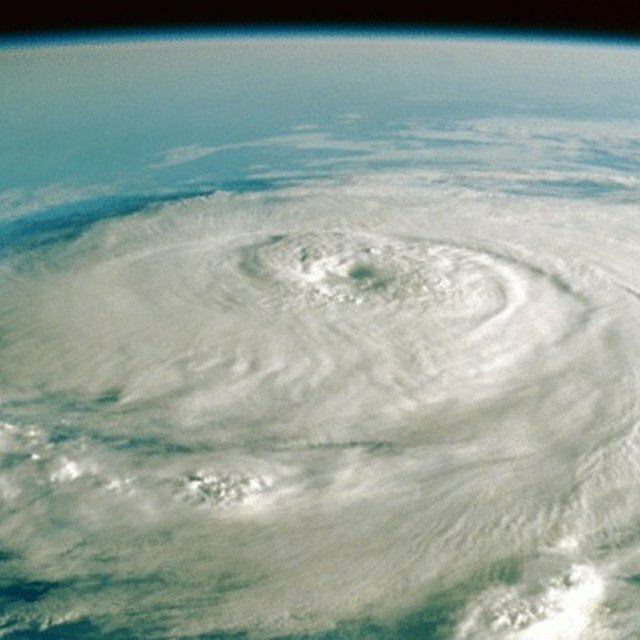 What Causes the Clouds of a Hurricane to Spiral? 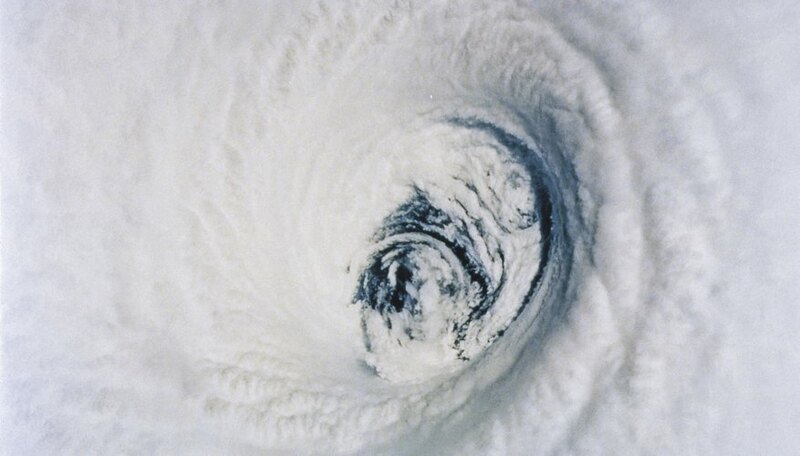 The satellite portrait of a hurricane is unmistakable: a mighty vortex of towering clouds, with a clear “eye” as the hub. These gargantuan, savage storms start out at low latitudes, shoved along by trade winds. Most such tropical cyclones form in distinct breeding grounds in the western and eastern North Pacific, the western Atlantic, the Indian Ocean and the western South Pacific. Along with “hurricane” -- their name in North and Central America -- they are variously called typhoons, baguios and cyclones. The ferocious spiral of their winds, which can rage beyond 240 kilometers per hour (150 mph), derives from a confluence of forces. Wind is the movement of air from areas of higher to lower atmospheric pressure. A low-pressure cell is called a cyclone, not to be confused with the regional term for hurricanes in the Indian Ocean. The opposite situation is the anticyclone, a high-pressure cell. Wind flows outward along a pressure gradient from an anticyclone, inward in a cyclone. A hurricane is a cyclone with a particularly severe pressure gradient, intensified by warm ocean waters and the latent energy of condensation. If the planet were stationary, winds would rush in to areas of low pressure head on -- that is, perpendicular to the lines of common pressure called isobars. The Earth, however, rotates, and that planetary spin diverts blowing air off straight-line paths. This rotational impact is called the Coriolis effect. In the Northern Hemisphere, winds are deflected to the right; in the Southern Hemisphere, to the left. Upper winds thus spiral around a low, roughly parallel to isobars -- counterclockwise in the Northern Hemisphere, clockwise in the Southern. The Coriolis effect is virtually nonexistent along the equator, and so hurricanes, despite their tropical habitat, don’t form within a few degrees of that global midriff, nor do they cross it: Low-pressure cells there are directly “filled” by incoming air, without the cyclonic whirling that helps birth a hurricane. Closer to the Earth’s surface, however, another force acts to modify air movement: friction. Lower winds drag against land or water and thus spiral more tightly around the low -- an effect usually seen within an altitude of 5,000 feet. The influence can be conceptualized in terms of angles. If the only force determining air movement were the pressure gradient, wind would flow at 90 degrees to isobars; under the influence of the Coriolis effect alone, it would flow at 0 degrees. Friction warps the angle of wind over isobars to somewhere between 0 and 90 degrees. The fiercest winds of a hurricane are generally those spiraling tightly and swiftly upward around the eye. These are the gales sucked in down the pressure gradient and hastened enormously by the condensing isobars near the center of the low. As they strengthen, the winds boost evaporation of surface waters; as they surge upwards, the water vapor condenses and releases massive amounts of latent heat energy. This fuels the hurricane and builds the towering thunderheads of the eyewall, into which the cyclone’s radiating rainbands corkscrew. The violent eyewall mounts tens of thousands of feet into the sky while in the eye of the hurricane air slowly sinks, discouraging cloud formation and keeping conditions there strangely calm. Air spun upward in the rainbands and eyewall then drifts outward from the center. How Do Air Currents Work? Shaw, Ethan. "What Causes the Clouds of a Hurricane to Spiral?" Sciencing, https://sciencing.com/causes-clouds-hurricane-spiral-4922.html. 25 August 2017. What Major Wind Belts Affect Our Climate the Most?